How’s that ‘strengthened international diplomacy’ working for U.S. Ambassador Christopher Stevens, whose body is being dragged through Libyan streets as we speak? Here is the full press release from the Nobel announcement in 2009, which in retrospect looks even more preposterous than it did when he originally won. 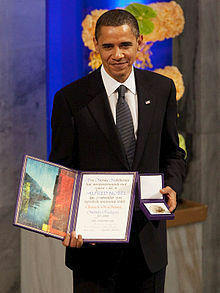 Obama – The man awarded a Nobel Peace Prize based not on tangible accomplishment, but simply upon expectations. Now that he has failed to meet those expectations, does the prize need to be returned? Previous post America Attacked Again on 9/11 ... and We Apologize?